America can breathe a sigh of relief. The economy is improving with the spring weather. The U.S. added 223,000 jobs in April, a healthy pick up after a disappointing March and about in line with what economists surveyed by CNNMoney projected. April's strong job gains reflect a trend the country saw last year: job growth cooling in the winter months, then gaining momentum into the spring. "They are good numbers," says Kate Warne, investment strategist at Edward Jones. "It's reassuring that we saw job growth rebound to above 200,000." The good news doesn't stop there. The unemployment rate dropped to 5.4%, its lowest mark since May 2008. This is likely to be helpful to Democratic presidential candidate Hillary Clinton. Many believe she needs the economy to keep growing until Election Day in order for her to win the presidency. Wall Street was very happy with the report. 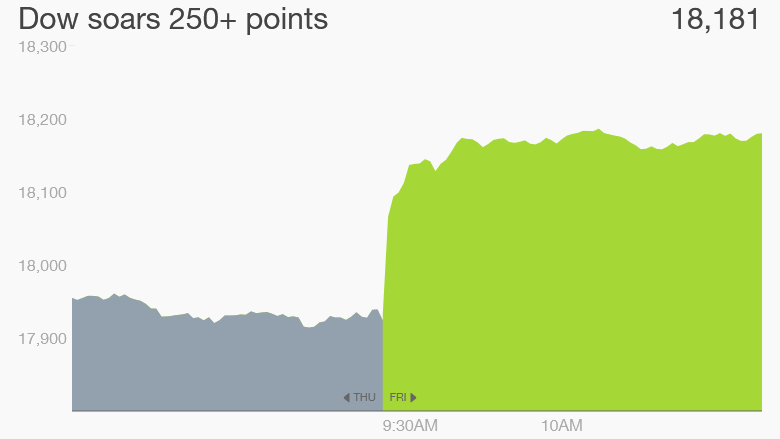 The Dow is soaring over 250 points (nearly 1.5%) in Friday trading, and the yield on the 10-year government bond fell substantially as investors cease worrying so much about a slowdown. The one thing regular Americans still want is better pay. There are finally signs it's picking up. 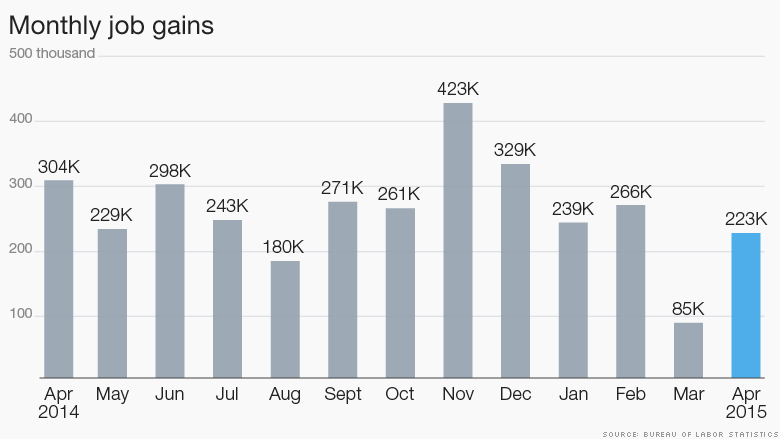 Wages are now growing at 2.2%, above the expectations from CNNMoney's survey. Experts say pay should continue to bump up if unemployment remains low. Where the jobs are: Hiring has been strong in many industries with one big exception: Energy. About 15,000 energy jobs -- oil drillers, coal miners and others -- were lost in April, the worst month for the sector since May 2009. Low gas prices are great for Americans at the pump, but they're causing energy companies to cut jobs. Energy jobs "took it on the chin once again," says Sam Bullard, senior economist at Wells Fargo Securities. "It certainly suggests the stronger dollar and lower oil prices are having a substantial impact." Despite the bad energy news, other industries picked up the slack. Construction and health care each added 45,000 jobs. Business services -- marketing, accountants, consultants -- was the best performer in April, adding 62,000 jobs. Related: America's capsizing economy: Can it right the ship? 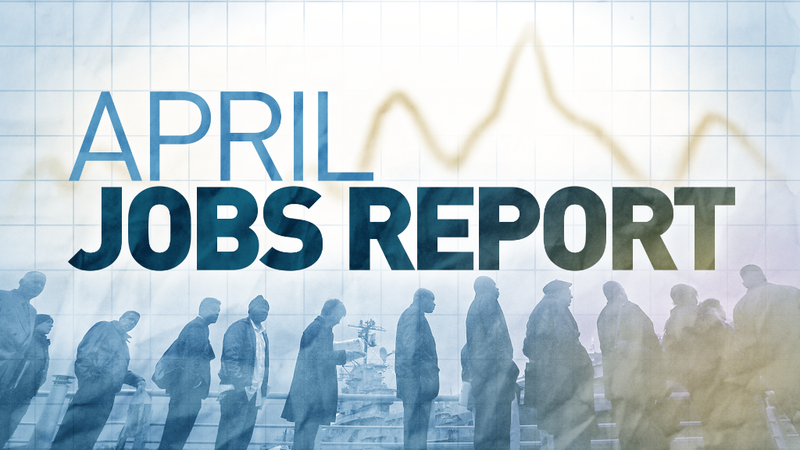 What's ahead: The April jobs report gives more fuel to the optimists who believe the U.S. economy will continue to expand. Last year was the best year for job gains since 1999. Then the winter of 2015 came. The economy barely grew in the first quarter this year. Many experts thought low gas prices would encourage Americans to spend during the winter months. Shoppers stayed home though as retail sales -- computers, clothes and cars -- were negative or near flat. The cold weather, strong U.S. dollar and West Coast port strike were the culprits for weak economic growth. Although April's job gains were good, they probably aren't enough to convince the Federal Reserve to raise its key interest rate in June, experts say. The Fed hasn't raised rates in almost a decade, and a rate hike would be the bank's two thumbs up for the economy's health. Most economists believe the Fed will raise rates in September or later now. Still, Friday's good job news suggests the tide could be turning in the right direction for the U.S. economy. "This is a net positive," says Bullard.